Lionel Messi will be offered an improved contract at Barcelona, according to club president Josep Bartomeu. The 26-year-old Argentina international's current deal expires in 2018 but Bartomeu insists he deserves a "modification". "We want to improve it because he deserves it, to adapt it to football's current circumstance," he said. Bartomeu declined to comment on the future of manager Gerardo Martino. Messi has been subjected to criticism in the Catalan press during Barcelona's slump in form that has seen them knocked out of the Champions League, lose the Copa del Rey final and fall to third place in La Liga. 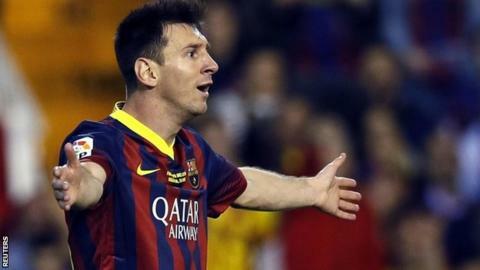 But ahead of Sunday's league match at home to Athletic Bilbao, Bartomeu said Messi needs to be looked after. Messi, who is Barcelona's record goal scorer, has hit 25 goals this campaign but has struggled for form in a number of key matches. "We are being unfair to Leo," Bartomeu told Esport3 television channel. "Our club members need to understand that we must take care of Messi. "He has made such an important contribution to this club and he will continue to do so. That's why we have no doubt that he will lead the future of the club. He is young, he is the best player in the world, and we believe in him." Bartomeu, who became president following the resignation of Sandro Rosell in January, added that he and his board would complete the remaining two years of their mandate - as originally planned when they were elected in 2010. He also said the squad would undergo an overhaul in the summer, if Barcelona can find a way to get Fifa to remove a transfer ban imposed earlier this month for violations in its signing of youth players. Bartomeu said that sporting director Andoni Zubizarreta would lead a project to carry out a "profound remodelling" of the team. Barcelona: End of an era?